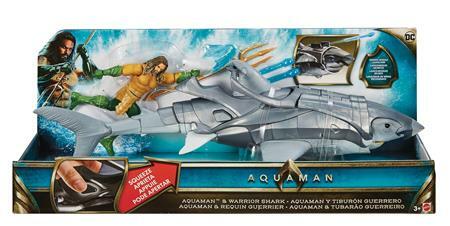 Aquaman must wage war to regain power over Atlantis. With this authentic, 6-inch scale Aquaman figure and giant 18-inch shark you can race through the violent depths on a course to victory! The Super Hero is primed to defeat his enemies in signature battle suit with a projectile firing weapon. The shark has a moveable fin and mouth that opens revealing lethal rows of teeth. Chase Super-Villain Black Manta, blast your weapon, open the shark's jowls and consume your foes alive!